In 2015, the city of Summerside, Prince Edward Island, achieved the highest level of wind power integration in North America. While the province of P.E.I. is already a leader with 26 per cent of its electricity coming from wind power, the City of Summerside Electric Utility has ratcheted that up to an astonishing 46 per cent by adding a smart grid with energy storage. In 2015, the city of Summerside, Prince Edward Island, achieved the highest level of wind power integration in North America. While the province of P.E.I. is already a leader with 26 per cent of its electricity coming from wind power, the City of Summerside Electric Utility has ratcheted that up to an astonishing 46 per cent by adding a smart grid with energy storage. Less than a decade ago, Summerside, like much of the rest of the province, had its diesel generators running 24/7 producing very expensive electricity. P.E.I. imports 75 per cent of its electricity from New Brunswick, and the only on-island generation was 200 megawatts of diesel generators. Diesel generation is expensive, very expensive -- costing 35 to 45 cents per kilowatt-hour. Something had to be done. The province was already home to the Wind Energy Institute of Canada and has among the best wind resource in the country. In just five years P.E.I. built 202 megawatts of wind power generation capacity in a province with a peaking load of 270 megawatts. The City of Summerside, population 15,000, piled on and built its own 12-megawatt wind farm and secured another nine megawatts of wind under contract from North Cape, P.E.I. This transformed Summerside's electrical grid almost overnight. The city realized it could produce wind power for five cents per kilowatt hour, around one-ninth the price of diesel power. 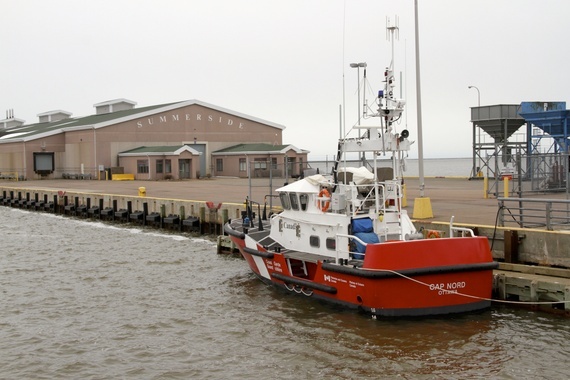 The City replaced nearly all of its diesel power and then had a new challenge: "In Summerside, we have too much wind at times," says Greg Gaudet, director of municipal services for the City of Summerside. In P.E.I. wind energy has a very high capacity factor, up to 50 per cent, but that still means you get too much wind power at times and too little at other times. To increase the amount of wind energy the City was using they needed energy storage. If energy storage has you seeing banks of expensive batteries, think again. The very pragmatic folks in Summerside instead started using water heaters and furnaces in local homes and businesses that can store energy as heat. They call it the "Heat for Less Now" program. Those appliances are hooked up to Summerside's spanking new smart grid, installed in 30 per cent of the homes in the city, which allows the utility to turn them on when the wind is blowing. The one big change for homeowners is lower home heating bills. Homeowners who purchase these energy-storing appliances get a discount on electricity for five years. They pay only eight cents per kilowatt hour, five cents less than the market rate and less than half as much as oil. Energy storage has helped Summerside get 46 per cent of its electricity from wind power. And they have done this with only 314 appliances hooked up to their smart grid. The Electric Thermal Storage (ETS) home furnaces are made by Steffes out of the U.S. and range in size from room heaters to full-size commercial heating units. The ductless heaters use electric powered heat pumps that operate with between 150 and 300 per cent efficiency to produce heat for the home., The units also produce extra heat when the wind is blowing and store that heat in thermally dense ceramic bricks for later use. Gaudet explains that even though the bricks get up to 1,200 degrees Fahrenheit (650 degrees C), the heater doesn't get very hot on the outside. "It's not going to hurt your kids or anything." 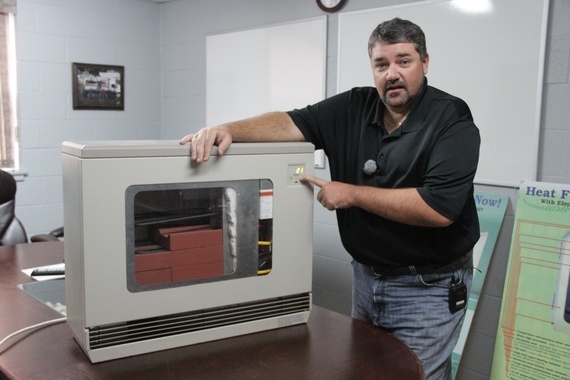 The heaters store energy as heat for up to three days, allowing Summerside to use their smart grid to run the heaters when the wind is blowing, saving that heat for use by the homeowner when it's needed. The water heaters are made by Marathon and are super insulated, allowing water to be heated to 77 degrees C under the control of Summerside's smart grid. The water heaters lose only one-quarter of a degree per hour and have mixing valves on top to mix the super hot water with cold water to ensure the home gets hot water that's not too hot to use, about 60 degrees C.
This allows the water heaters to use off-peak electricity when the wind is blowing, helping Summerside use even more wind power at a rate discounted by 35 per cent for residents. In P.E.I. energy circles, Summerside found the Holy Grail of affordable clean electricity. And they're not just replacing diesel generated electricity, they're also replacing heating oil, since Summerside is also shifting home systems from fuel oil to wind power. "A lot of people in Summerside in Prince Edward Island have used fossil fuels to heat their homes and hot water over the years, because electricity prices have been high. We're finding with displacing those emissions from fossil fuels and using renewable energy from the wind to power the hot water and heat we're seeing a 42 per cent to as high as 85 per cent reduction in the home's greenhouse gas emissions," says Gaudet. With only 314 appliances installed, Summerside is able to shift 10 per cent of its electricity demand to times when the wind is blowing. This has been a game changer. For the last three years the City has been powered by 100 per cent wind energy 20 per cent of the time. The City utility says customers are saving 15 to 40 per cent on home heating, while customer satisfaction is running at 99 per cent. In pretty short order Summerside has become a North American leader at integrating wind power using smart grid and energy storage technologies.